Try discovering Madrid the same way natives get around - on a Vespa! Providing a very distinct service, the company Trip Chic offer visitors to Madrid the opportunity to hire Vespa motorcycles as a standard rental, as part of a private guided tour or even with a personal shopper! UK riders - If you have a standard Car drivers license you may ride a motorcycle in Spain of up to 50cc. Any motorcycle hire in Spain above 50cc requires the full riders license. USA riders - Your state issued drivers licence is not valid in Spain. You will need to acquire an International driving permit. When contacted by Trip Chic about their service we asked one simple question - What makes Trip Chic useful to visitors to Madrid? "We are a company dedicated to renting Vespas in Madrid to visitors who wish to maximize their visit. We also provide guided Tours through the city. We are proud to say that our Vespas are the lastest models in the market, always in perfect appearance and technical condition." ¿Why are we different to the other services? 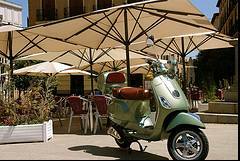 Trip Chic are the only company renting Vespas in Madrid: LXV special edition vintage 125cc and LX touring 50cc. Our Vespas don´t have any publicity, so the customer feel like the owner. We bring the Vespa to whatever point in the city you wish eg: hotel and will collect the motorcycle at the end from where ever the client wishes. Our personal service extends to providing guided personal Tours where we show to you the main attractions and landmarks of Madrid. Trip Chic make every effort to ensure your visit is special, perhaps according to your interest? If you want a gastronomic Tour, or to take in a Musical,... we can organise this for you. Trip Chic are more than a common rent company, our philosophy is get in your visit a comfortable feeling, and a Vip style, special and different. A new shopping chic! service has been incorporated. Our personal shopper will show to you the different places and showrooms of the capital. She will advise to you according your style, preferences and budget. If you are in business meeting or attending a conference, we know that your spare time is both important and short. So we will bring to you a Vespa to your Hotel at the time you want. Just call us and we will be there for your business-break.